Brentford remained second in the Championship despite a spirited second-half fightback from Ipswich Town that saw the bottom side gain a point. Neal Maupay's looping header after Ollie Watkins' miscued shot gave the Bees the lead as they dominated the first half. After a tactical change, Town impressed and, having hit the bar, Kayden Jackson deservedly levelled soon after as he headed home Trevoh Chalobah's cross. Yoann Barbet hit the bar for the Bees while Jackson had two chances to win it late on for Town, but his long-range effort was saved before he blazed over when through on goal in stoppage time. Before the game, a minute's applause was observed in memory of Ipswich legend Kevin Beattie who passed away on Sunday, while fans cheered his name in the sixth minute in memory of his shirt number. Ipswich boss Paul Hurst made five changes - bringing in three centre-halves and wing backs - in a bid to get his side's first win of the season, but at times the changes seemed to confuse Town as they regularly made mistakes. 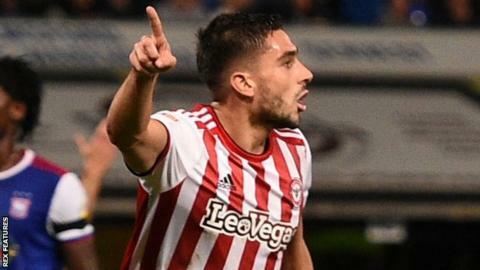 Maupay was booked after four minutes as he went down under a challenge from Dean Gerken in the box and was adjudged to have dived, while the league's top scorer had a 14th-minute header cleared off the line and Romaine Sawyers' fizzing cross was almost turned in. Having been booed off at half time, Hurst brought on Gwion Edwards and Jon Nolan and switched to a back four with remarkable effect - Jonas Knudsen twice went close while Jackson's overhead kick hit the woodwork. At the other end, Gerken denied Maupay while Barbet's long-range free-kick rattled the bar before Jackson levelled. And the summer signing from Accrington should have sealed all three points late on - had he passed to Edwards when through on goal in stoppage time, Town could have been celebrating a first win of the season. "We tried something first half and didn't quite cause the problems that we would've liked. "You have to give massive credit to the opposition and going into it, this was a daunting task. "I have to also give massive credit to my players to hang on in there and once we equalised, the game could've have gone either way." "First half we were outstanding and put in an awful lot of energy and dominated the game. We created a lot of chances and should have been more than one goal up. "That's the reason we haven't walked away with three points because the first-half performance was right up there and they found it very difficult. "Second half they changed their system, put lots of balls in the box and we probably didn't cope with it as well as we should have. When I look back, the game will be about the big chances and we should have taken more than one." Match ends, Ipswich Town 1, Brentford 1. Second Half ends, Ipswich Town 1, Brentford 1. Jonas Knudsen (Ipswich Town) is shown the yellow card for a bad foul. Romaine Sawyers (Brentford) wins a free kick on the right wing. Attempt missed. Kayden Jackson (Ipswich Town) right footed shot from the right side of the box is just a bit too high. Assisted by Flynn Downes with a through ball. Foul by Janoi Donacien (Ipswich Town). Attempt saved. Kayden Jackson (Ipswich Town) right footed shot from outside the box is saved in the centre of the goal. Assisted by Jon Nolan. Substitution, Ipswich Town. Flynn Downes replaces Trevoh Chalobah. Gwion Edwards (Ipswich Town) wins a free kick on the left wing. Substitution, Brentford. Alan Judge replaces Neal Maupay. Attempt blocked. Neal Maupay (Brentford) right footed shot from outside the box is blocked. Assisted by Chris Mepham. Nico Yennaris (Brentford) wins a free kick on the left wing. Corner, Ipswich Town. Conceded by Chris Mepham. Attempt blocked. Sergi Canos (Brentford) left footed shot from the centre of the box is blocked. Goal! Ipswich Town 1, Brentford 1. Kayden Jackson (Ipswich Town) header from the centre of the box to the top left corner. Assisted by Trevoh Chalobah with a cross. Kayden Jackson (Ipswich Town) wins a free kick in the attacking half. Corner, Brentford. Conceded by Gwion Edwards. Substitution, Brentford. Nico Yennaris replaces Josh McEachran. Attempt missed. Neal Maupay (Brentford) right footed shot from outside the box is high and wide to the left. Assisted by Josh McEachran. Corner, Ipswich Town. Conceded by Ezri Konsa Ngoyo. Yoann Barbet (Brentford) hits the bar with a left footed shot from outside the box from a direct free kick. Hand ball by Matthew Pennington (Ipswich Town). Attempt saved. Neal Maupay (Brentford) left footed shot from the centre of the box is saved in the centre of the goal. Assisted by Kamohelo Mokotjo with a through ball. Substitution, Brentford. Sergi Canos replaces Said Benrahma. Corner, Ipswich Town. Conceded by Henrik Dalsgaard.